ENTERTAINMENT WEEKLY: You’ve had an extraordinarily successful year. Is there a moment or decision which makes you particularly proud? JENNIFER LAWRENCE: Personally, yes. Business-wise no. I don’t think I’ve ever done that. No matter what anyone says, I’m my own worst critic. Well, if I was talking to your parents instead, what might they say was their proudest moment? You said you’re pleased with some of your personal decisions. Do you care to share a triumphant moment? I was going to buy a place and then I realized that I’m just not old enough to own property. Everybody else was — Josh and Liam [her Hunger Games co-stars] bought a house, I was like, Okay I got to buy a house, that’s what’s supposed to happen. And then I finally was like ‘You know what? I’m going to rent until I’m old enough to buy a house.’ That was a huge weight off my shoulders. Before the Hunger Games came out you told me you knew your life would be forever altered and that it was rare to meet a famous person who wasn’t jaded? After this year of massive attention, do you feel jaded yourself? I’m different. It’s exciting for about five minutes — like walking through a restaurant and hearing people say your name to each other. After a while it starts to get creepy and scary and you feel cynical and now I do this thing where I’ve got this tunnel vision where I only see people that I recognize. I don’t look at strangers because I know if I look I’m going to make eye contact with people. I always imagined I would stay the exact same and I would be just as happy. And I’m not. It’s not that I’m ungrateful at all. Or unhappy. It’s just that people are different and it creeps me out so I only want to be around the people who still treat me the same. I don’t go home and brush my teeth and think I’m brushing my teeth like a famous person! You don’t notice it at all until you talk to a stranger and you realize they’re treating you differently and looking at you differently. And yet you seem to have avoided the ugly tabloid attention faced by other young stars. I’m just really boring. [Laughs] They’ve tried. There’ve been stories that are so not true and quotes that have been taken completely out of context. Like I’m dating John Mayer, when I’ve met him once. But the truth is I’m always in my house at five and sitting on my couch and going to bed at nine. That sounds like lots of time for pop culture! Who and what entertained you this year? What don’t I love about Game of Thrones? I was shooting in Prague so I didn’t have TV and I just got box sets of DVDs. I just watched Game of Thrones straight. I was obsessed, like I haven’t been since my Harry Potter days. Let’s see, my favorite movie was probably Ted. It is so, so funny. Any my favorite performance? Any time I see John Hawkes. He was so good in The Sessions. He always does that to me. We know that Suzanne has said that she doesn't write children's books, she writes about war for children. Suzanne based The Hunger Games on a lot of her own experience of what she knew from her Father's experience of the Vietnam War. Scholastic has announced that they are publishing her autobiographical picture book about this time in her life. Check out the press release below! New York, NY — November 29, 2012 — Scholastic, the global children’s publishing, education and media company, today announced the publication of Year of the Jungle (September 10, 2013), an autobiographical picture book by Suzanne Collins, author of the worldwide bestselling The Hunger Games trilogy, with illustrations by James Proimos. Scholastic also announced plans to publish the trade paperback edition of Catching Fire (June 4, 2013, ISBN: 978-0-545-58617-7, $12.99), as well as repackaged paperback editions of Collins’s bestselling The Underland Chronicles, a five-book series about Gregor the Overlander, featuring all new cover art (Summer 2013). Scholastic will publish and deliver the books through all of its distribution channels. 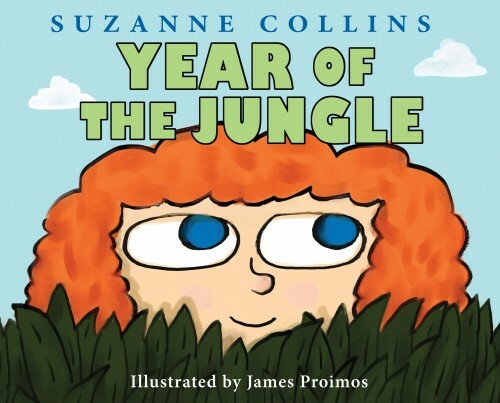 Year of the Jungle ($17.99, ISBN: 978-0-545-42516-2), to be published on September 10, 2013, is an autobiographical picture book for ages 4 and up, based on the year Suzanne Collins’s father served in Viet Nam. The book is illustrated by James Proimos, an acclaimed picture book author-artist and television writer/animator. Longtime friends, Collins credits Proimos for initially suggesting she write books for children while they were working in children’s television together. In Year of the Jungle, when young Suzy’s father leaves for Viet Nam, she struggles to deal with his absence. What is the jungle like? Will her father be safe? When will he return? The months slip by, marked by the passing of the familiar holidays and the postcards that her father sends. With each one, he feels more and more distant, and when he returns, Suzy must learn that even though war has changed him, he still loves her just the same. We're really thrilled about this project. It has always been intriguing how Suzanne has tapped into her personal experience creating The Hunger Games, so we will be interested to check this one out when it releases in 2013. Although it is slightly disappointing the whole movie has not been shot in IMAX, I really think there is something truly creative about the idea of just the arena scenes in IMAX. It's quite a nifty audience immersing tool, as the video mentions connecting the idea to a "Wizard of Oz" moment. Isn't it cool we are getting more and more details about Catching Fire? We just wanna wish all you devoted Hunger Games fans a fantabulous Thanksgiving (raise your hand if you're using an ACTUAL cornucopia!) 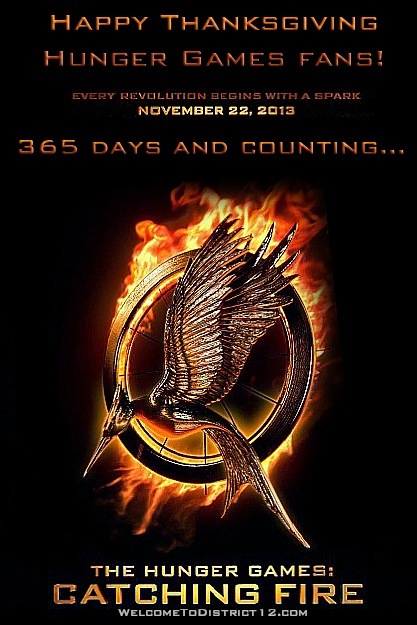 and to give you an even better reason to have thanks this year... Catching Fire is only ONE year away! I know it may seem long, but the day will come before you know it! We also have unexpected surprises in store while we wait for November 22nd, 2013. We hope Lionsgate has some great stuff for fans in store this next year in their Catching Fire marketing campaign. We can't wait! As always, thank you so much for all the support you fans have given us the past two years. We are just astounded by this supportive fan community, and we look forward to the years to come! At last it has arrived! If you've been keeping up to date with Catching Fire news, you'd know that the Catching Fire logo has been appearing before some screenings of Twilight Breaking Dawn Part 2. While this information surfacing on the web was leaked information, we've been waiting on Lionsgate's official online release to post it. Whether you've already seen it or new to the party....HERE IT IS! UPDATE: To enter, go to catchingfirelogo.com, share, and it should give you a form to fill out for your entry. Alternatively, under the social networking icons at the bottom click the "skip" link and it will take you right to the entry form. Check out the press release, which also mentions a contest in which you could have your name in the credits of Catching Fire! 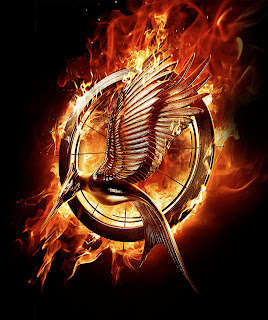 Lionsgate has officially unveiled the new logo for THE HUNGER GAMES: CATCHING FIRE in the form of a MOTION POSTER exclusively on the HUNGER GAMES Facebook page. Please share this with your readers. 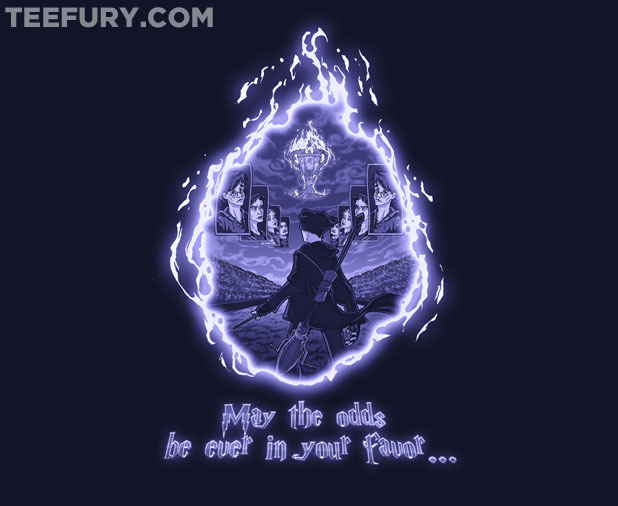 Check out today's Teefury! It's called "The Potter Games", combining Harry Potter and The Hunger Games. Coincidentally, we participated in making a series of choose-your-own-adventure games also called "The Potter Games". You should totally try it out!! Head over to TeeFury.com to buy the shirt. It's only available for 24 hours! After a few minor set backs and much anticipation, Victory Tour 2013 would like to announce the dates and location of the convention: June 19-22, 2013 in Charlotte, North Carolina. Two registration levels are currently available for purchase: Citizen Registration and Rebel Registration. Lit Day is available for Citizens to purchase separately and is included with the Rebel registration fee. Attendance for the event has been maxed out at 500 to insure the quality of the experience for all attendees and the availability to attend and participate in main stage and interactive events. Only 200 Rebel registrations will be available. As we secure special guests, additional options, such as autographs, will become available. We encourage attendees to stay at the hotel at which the convention will take place, which will help in supporting the convention as well as make your experience more cohesive. A special group rate will be available for convention attendees. The link for the hotel will be provided in the coming weeks. 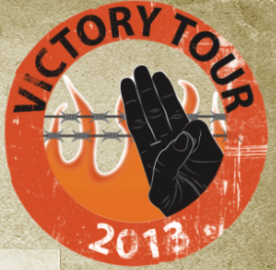 Will you be going to the Victory Tour 2013? Remember the Fox/Lionsgate debacle concerning Jennifer Lawrence's scheduling? The reason that the Catching Fire production schedule is so cramped is because the X-Men First Class sequel was due to start production in January. Now it seems they are pushing production to April, which if this is indeed true, means the production schedule can relax a little. Since earlier this year, there has been a large focus on Jennifer Lawrence and two of her upcoming projects: The Hunger Games: Catching Fire and X-Men: Days of Future Past. The actress torn between both sequels, reports surfaced that 20th Century Fox would be aiming for a January start which would only rush the production for Catching Fire in the process. But in the months since, Days of Future Past has hit at least one major snag while filming still continues strong for Catching Fire. Now, it seems one of the two studios have finally budged and finally makes more sense of the schedule at hand. The Geek Files over at Coventry Telegraph (via CBM) reports that filming for X-Men: Days of Future Past has been pushed from a January 2013 start to an April date. 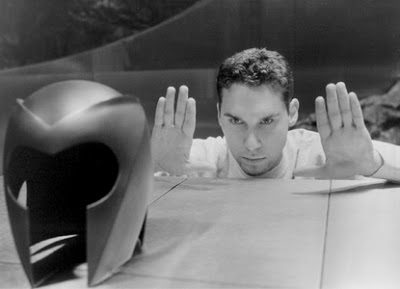 The push allows not only for an extended filming of The Hunger Games: Catching Fire for Lawrence, but will also give Bryan Singer time to adjust the script for Days of Future Past into his vision before pre-production begins and as set begin construction. @gabyrosas won the signed poster! JensCakeBalls won the Mockingjay lightbulb! @MoMoKelley1 won the magnet set! @natalie9nicole won the Katniss lanyard! @Amy_Katherine3 won the candle holder! Congrats to those who won! We will be sending out prizes this weekend! A post long overdue! Victory Tour 2013 has made some changes since we posted about it last time, so we wanted to make sure you guys were up to date! As of now, in addition to Hunger Games awesomeness at the convention, other young adult book series will also be present. Also, as announced on tonight's HG Fireside Chat, registration will be open tonight at MIDNIGHT! Over the past few weeks, we have been dealing with some legal issues involving the convention. This has encouraged us to expand the convention to include some other fan favorites. This gives us the opportunity to include all of the events we have already announced plus add a layer to the convention that didn’t previously exist through other much loved novels and films. We are hoping these additions give attendees the opportunity to explore some new books and fandoms, as well as contrast and compare their favorites with other fans. We look forward to bringing this convention to life and can’t wait to see you there! Please be aware that this change may affect the registration date. Stay tuned for updates and changes! For a peek at the books we’re considering, see our new “The Books” section under “Programming”. Thanks for your continued support and excitement!